The island of Mallorca or Majorca is the largest of of the four Balearic Islands found in the Mediterrnean Sea. The four islands are: Mallorca, Menorca, Formentera and Ibiza. Because of its warm climate and location, it is a popular summer destination for European tourists, especially those from England and Germany. The island is covered with many natural hidden treasures. While many go there just for the beach life, others feel attracted to the island landscapes, such as the mountains, breathtaking cliffs over the Mediterrnean Sea or the hidden coves, the quaint villages and the Mediterrnean flair of the island. These are highlights of Mallorca from travels to towns and natural locations throughout the whole island and also the fantastic city of Palma. Cap Formentor in the image above is the most northern tip of the island and has a gorgeous landscape. There is an area there where you can park and walk to a platform to take fantastic photos. 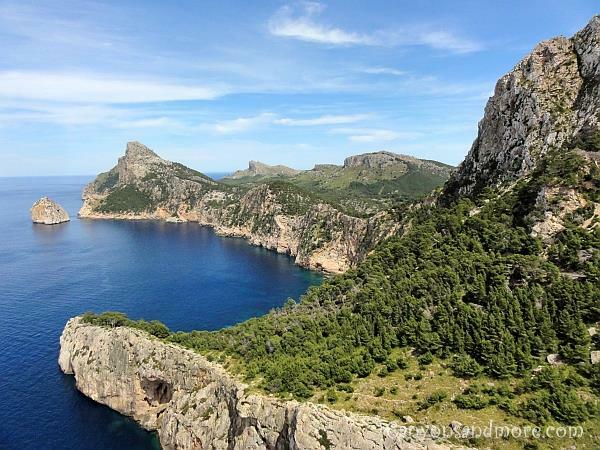 To get to Cap Formentor, you must really travel a very narrow serpentine mountainous road to reach it. Oncoming busses from the opposite direction will make you realize how narrow the road is. It somehow always seems to work, though. There is also a saying on the island that says if you have a car with no dents or scratches, then you must be doing something wrong. Practically every car you see has some sort of slight damage. It is almost unavoidable. Palma de Mallorca is the capitol city of the island of Mallorca and is located on the southern part of the island directly on the Mediterrnean Sea. 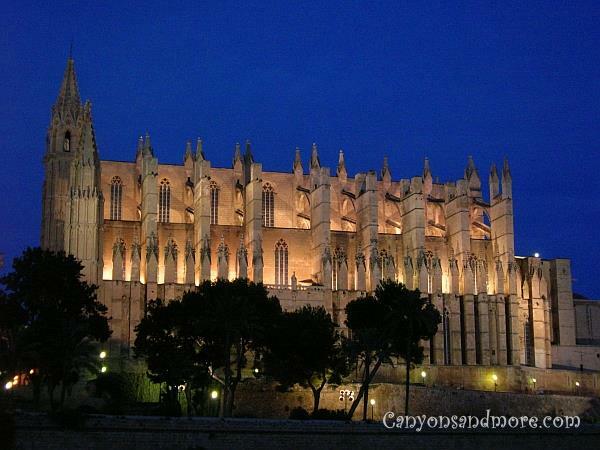 Palma has a most beautiful cathedral “La Seu” and a castle, both which dominate the skyline of the city. This gothic styled castle is situated on the site of a moslem mosque, which explains why the castle has an Arabic look to it. You can walk all around the grounds of the cathedral as well as go inside to admire this fantastic piece of architecture. This building of the cathedral started in the year 1306 and was not completed until 1601. 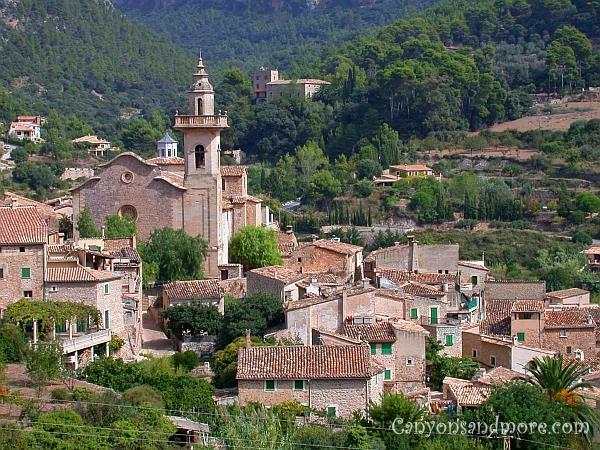 Nested in a valley and close to the west coast of Mallorca, this quaint town called Valldemossa is a must see if you visit the island. There is something so warming about the simple Mediterannean style of architecture. In the summer the balconies and porches are decorated with clay pots of flowers and the green shutters offset the otherwise calm terracotta color of the buildings. The town of Valledemossa takes pride in its streets and if you are ever there, take a stroll through the all of the alleys surrounding the center of town. They are small and the homes are of the natural stone that is common to Mallorca. Practically each entranceway is tastefully decorated with terracotta flower pots hanging on the walls and around the doorways. It all looks so romantic and has a genuine charm to it. Peguera is located on the south coast of the island and is a popular destination for travellers from Germany and Great Britain. 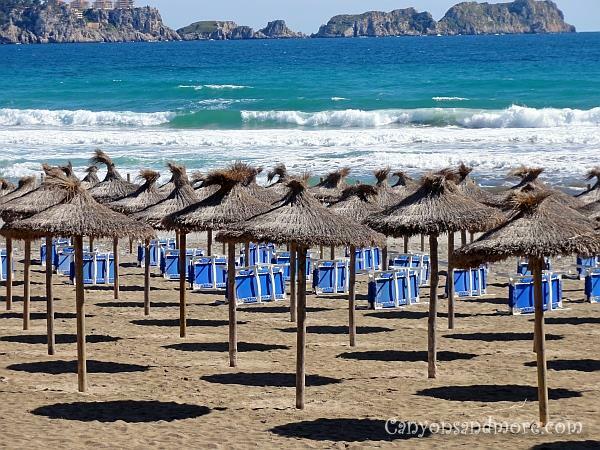 The beach of Peguera is fabulous during the day and the boulevard is a fun destination for later hours. Shops are open late and there are plenty of locations to eat or have a coctail. The city is nestled between the Mediterranean Sea and mountains so nature is all around you. 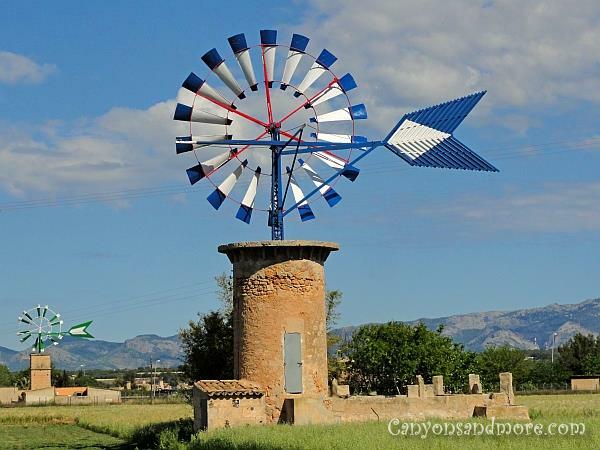 Windmills were once so abundant on the island and these days you are lucky to see one that is still functioning. You still see them scattered all over the island but their flourishing days are over as the most of them are worn down and falling apart. They are anyway still a symbol of the island and the one in this image is still in excellent condition. It was seen while travelling from the east coast to the west through the middle of the island. Cala Figuera small fishertown located on the east coast. This town is a charming destination and the place you want to go to get away from the major tourist areas and simply see a town in its original state. It is a quiet and quaint location. The houses are situated on the water where the boats are parked and you can walk all through the area and admire the village and see the fishermen preparing their nets for the next catch at the sea. 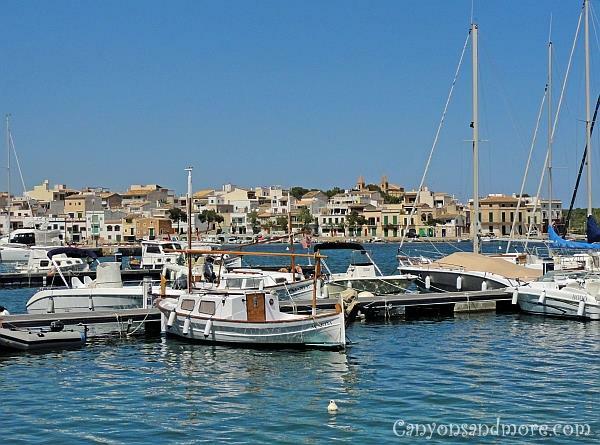 Portocolom has a lovely harbour area to take an afternoon walk on. Across the bay you see the typical quaint but charming looking homes of the residents who live there. If you like, there are also possibilities to rent a boat and cruise the area by sea to get a different perpective of the town. 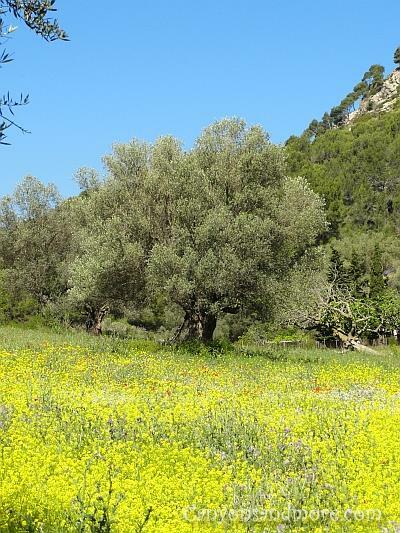 The month of May on Mallorca is a gorgeous time to visit the island. It is not as hot as it can get in the summer and the fields are still green and also in full bloom. This field was abundant with gorgeous yellow and white flowers and a couple of poppies could be seen as well. The tree in the center of this picture seemed to be an olive tree, but was not yet bearing fruit. It is worth taking the train from Palma de Mallorca to Soller. 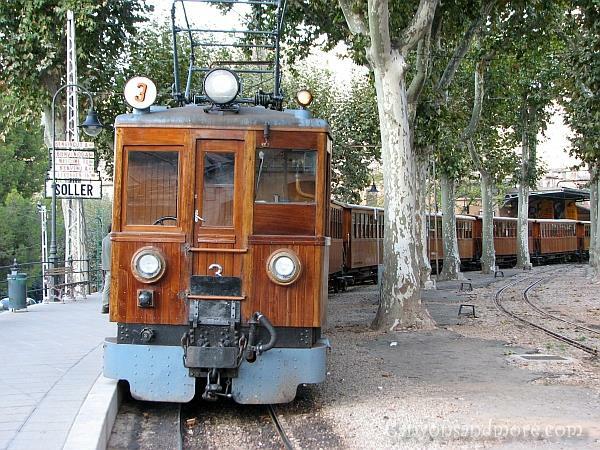 From the Estacio Intermodal in Palma, you can take this train ride through the countryside to Soller. Since 1912 this nostalgic train has been travelling this route and even today, it is in great condition. 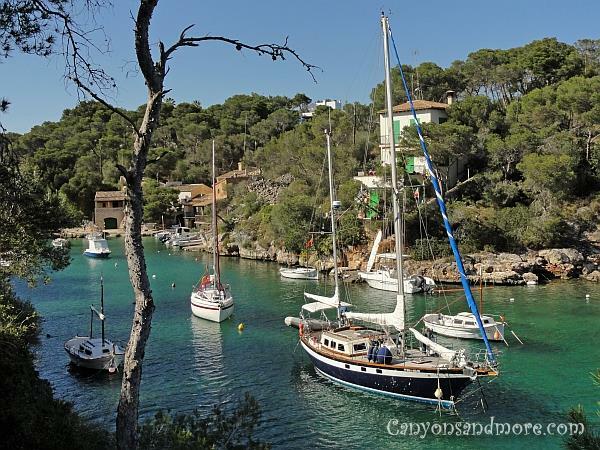 Once in Soller, enjoy your stay in the town or take the tram to the Port of Soller. 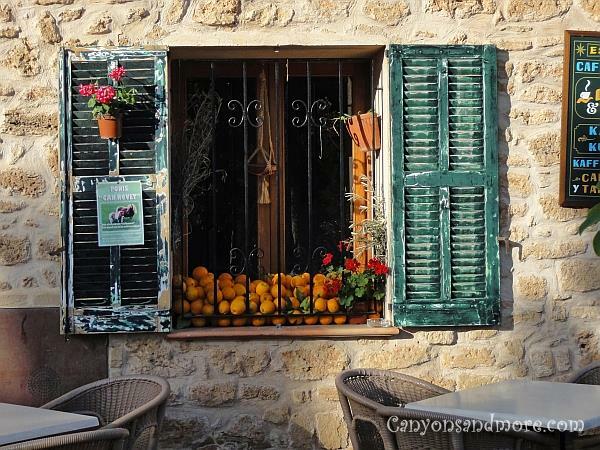 This window was seen at a café in Alcudia. What a cozy place to sit and enjoy a cup of coffee and watch the locals and tourists pass by.